Congratulations to Jake and Kevin who were co-recognized as Athletes of The Week at CrossFit Amundson. In addition to their stellar and disciplined CrossFit performance over the past two years, Kevin and Jake are two of the most advanced Krav Maga practioners at Krav Maga Santa Cruz. Both Kevin and Jake first enrolled into our Krav Maga program in 2012 when Krav Maga was still held at our Headquarters facility. Jake and Kevin have been training partners for nearly two years, and their intensity, focus and drive to excel in both Krav Maga and CrossFit is inspiring. 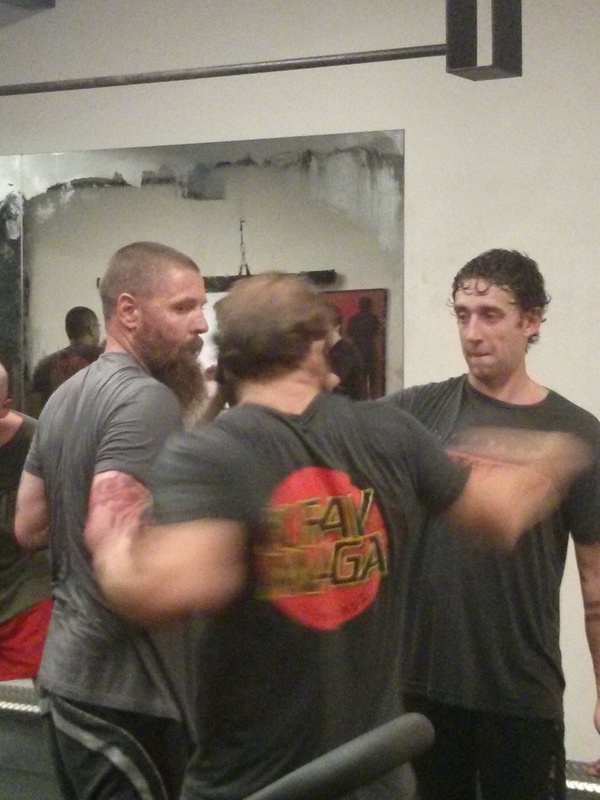 Last Wednesday, Kevin and Jake teamed up on the Phase A Krav Maga test, and the result of their combined level of effort was a sight to behold. Both of these Athletes display on a daily basis the courage, heart and energy of a True Warrior. Congratulations men on all your success, both inside and outside the gym. Note: Our new CrossFit Light program begins today! The CrossFit Light class meets Monday through Thursday from 5:00 PM to 6:00 PM. Our “CrossFit LIGHT” class stands for Lifetime Integrated Gymnastics Health and Training. This class focuses on the benefits of the CrossFit program without the demands of a Barbell. Instead, the LIGHT class uses Kettlebells, Medicine Balls, Slam Balls, Concept 2 Rowers, Aerodyne Bikes, Weighted Jump-Ropes and a variety of challenging yet scalable gymnastics skills to strengthen, tone, and condition the entire body. We also refer to this class as our “Lifetime Fitness” class, because the program is designed to support Athletes over the span of their entire lifetime. This class was created by Greg Amundson and is based on his own CrossFit training program of over 14 years. Note: Our Barbell Club begins again today and will be following the proven Wendler 5-3-1 Strength Cycle. In order to accurately ensure the success of this program it is very important to determine your 1RM efforts in the “Strength Lifts”. The CrossFit Amundson “Clinic Class” is a unique offering for CrossFit gyms in Santa Cruz County. This class operates like a mini “Clinic” or Seminar, and focuses on the 9 Foundational CrossFit Skills and basic Gymnastic skills. This class also includes a slightly scaled Workout Of the Day (WOD). Below is the programming for each month. Athletes may attend the Clinic as their main workout, or attend the Clinic on an “as needed basis” to focus on specific skills. The Clinic repeats each month and will take the place of the former “Boot Camp” and “Foundations” class. WEEK 1: Squat – Front Squat and Overhead Squat. Pull-up and Push-up. WEEK 2: Deadlift, Sumo-Deadlift, Bench Press. Kettlebell Swing and Ball Slam. WEEK 3: Power Clean, Hang Power Clean and Squat Clean. Rope Climb and Dip. WEEK 4: Press, Push-Press, Push-Jerk. Concept 2 Rowing and Aerodyne Bike. Please note beginning this month we will only be offering an evening Warrior Body Zen Mind Yoga practice. Evening Yoga will be 6:00 PM – 7:00 PM on Tuesday and Thursday. Our new Krav Maga Phase A and Krav Maga Phase B will begin third week of November. Phase A will be Monday and Wednesday 6:15 PM to 7:00 PM and Phase B will be 7:15 PM to 8:00 PM. All Phase B Krav Maga Athletes may participate in Phase A classes.